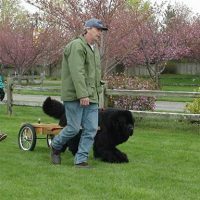 Newfoundland dogs are a giant breed that originated in Canada as a working dog in coastal areas of the country, particularly the province of Newfoundland. They are historically known for rescuing drowning sailors. The breed is related to many other giant breeds, including the St. Bernard and Leonberger, but predates both, having their early ancestry in dogs brought to North America by the Vikings. They are sometimes called Newfies for short. In terms of size, Newfoundlands are classed as a giant breed. They tend to have very large heads and broad backs. Their coat coloration does not tend to influence size. Females can weigh between 121 lbs and 143 lbs while males weight between 143 lbs and 176 lbs. Obese dogs may exceed these weight ranges. The average height at the withers (shoulders) for a male is 28 inches; for females, it is 26 inches. The common range is between 22 and 30 inches. Newfoundland dogs have four recognized coat colors: black, brown, gray, and Landseer, which is best described as white with black markings. Not all organizations recognize all of these colors; black is universally recognized and is the most common coat color for the breed. The Landseer pattern is named for the painter Edwin Henry Landseer, who frequently featured them in his work. The coat itself is an oily double-coat, suited to swimming in cold northern waters. Newfies tend to shed their undercoat on a regular basis and require regular grooming because of this and their overall coat length. The breed is known for their mild temperament, which is similar to that of Golden Retrievers, although generally calmer and less active. They have long been valued as family pets, despite their size, even for families with small children. The breed has frequently been credited with saving children and adults from drowning due their innate swimming ability and desire to perform water rescues. In general, Newfies are very docile, eager to please, and intelligent with amiable personalities that are similar to other working dog breeds. They take to training well, especially to positive reinforcement. Because of their size, training is highly recommended to prevent behavior like jumping on people, which can be problematic in a dog of this size. Dogs from this breed are frequently trained as therapy dogs and are particularly well-suited to working with children. As with most large or giant dog breeds, Newfies are susceptible to bloat, especially as they get older. This is when the stomach undergoes torsion, trapping food and/or gas inside. The condition is often fatal. They are also prone to hip and elbow dysplasia. This can have a negative impact on their mobility, but is not life-threatening. Of these two conditions, hip dysplasia is more common. A common genetic heart condition they experience is subvalvular aortic stenosis (SAS), which is a defect in their heart valves. This can potentially cause them to have heart attacks, even at a relatively young age. Overall, Newfoundlands have a life expectancy of 8 to 10 years. Many factors influence their lifespan, including genetics, diet, activity level, and regular veterinary care. Some dogs have lived as long as 15 years; however, these are exceptional. 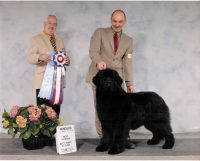 Newfies have won the Westminster Kennel Club Best in Show award twice. These wins took place twenty years apart in 1984 and 2004. The litter size for the breed can range from 4 to 12 puppies. Although small at birth, a Newfie puppy will outweigh an adult Chihuahua by the time it is four weeks old, weighing 11 lbs on average at this time. There is an Italian School of Water Rescue Dogs. The school makes frequent use of this breed in its training programs, attesting to their continuing utility in water rescues. This ability has been reliably documented for more than two hundred years. The dog, Nana, from the J. M. Barrie book Peter Pan was written as a Newfoundland and was based on the author’s own dog, Luath. A Newfie named Seaman accompanied the Lewis and Clark expedition across North America. He belonged to explorer, Meriwether Lewis. There is a statue to him in the city of St. Helens, Oregon and in at least seven other locations on the expedition’s route. Other famous owners of this breed include President Ulysses S. Grant, President Lyndon B. Johnson, Senator Robert F. Kennedy, composer Richard Wagner, poet Lord Byron, writer Emily Dickinson, and naturalist John James Audubon.